I freaking love The Tournament. It's almost a joke among my family and friends. When the NCAA Men's Basketball Tournament rolls around, the retired cheerleader comes out in me in a major way. As does the type A++ planner. My brackets are always kept up to date, using that year's "bracket pen." (Oh, come on. Nothing looks tackier than mixing ink types/colors.) I always know what game is on and what channel is carrying it. I know the seeds and the backstories. I've tried all season to keep up with other conferences, just so I can talk about their teams, their players, and their respective strengths. Apparently, it's funny how obsessive I get with watching mid-major games from other time zones, just so I'll know what's in the field. Some people call it ridiculous; I call it being prepared. I don't want any surprises going into The Tournament. I guess it's the curse of being a coach's daughter. Now, this year, The Tournament brought more surprises than I could ever anticipate. My beloved Wildcats, coming off an abysmal season, didn't even earn an invitation. I found myself watching from a distance -- not really caring even when teams I'm interested in (or hate) were playing. But, then, Sunday night, something changed. Louisville guard Kevin Ware suffered the most horrific injury I've seen in a long-assed time. Just watching it on TV was gut-wrenching. Twitter equated it to the Joe Theismann - Lawrence Taylor injury (y'all Lee Anne Tuohy fans know the one...); all I could think of was the time I was standing at the rail at Keeneland when a horse went down and threw a jockey. Even though sports are fueled by high speeds and high level physical performance, you just never really expect a serious injury to occur. As a spectator, you're physically sick and you just don't want to be there any more. Personally, I just can't watch the injury footage. I turned the TV off when it was Marcus Lattimore back in football season, and when it was our own Nerlens Noel earlier this year. This time, I almost followed suit, but I was haunted by the image before me. It wasn't the replays of the awful fall that got to me. It wasn't the graphic focus on Ware's injury. It was the pure pain and love and despair expressed by his fellow Cardinals. These boys were in anguish at the site of their teammate's pain. And they channeled their own pain into one of the most convincing victories I've seen this season. Coach Pitino, whom I've scorned for as long as I can remember, was brushing away real live tears of heartbreak. 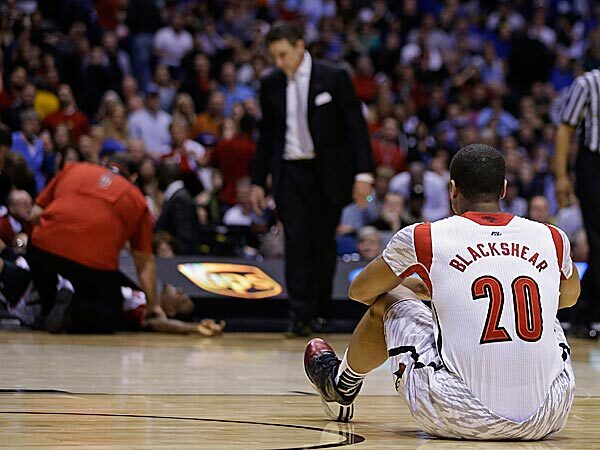 Chane Behanan donned his teammate's number as a tribute. And they beat the crap out of Duke, which is always a good thing. Two hours earlier, I'd been fed up with the sanctimonious folks who'd wanted to ruin my Easter by reminding me that Louisville "is still an in-state school" and that I should support them. As I tweeted from Easter dinner, I'm fully apprised of the city's geography. They aren't my team. I just wasn't cheering for anybody. But, as I watched the way those kids pulled together, I realized where my focus should be, at least for the next week. Geography or rivalry aside, these kids are a team. They like each other a lot, and they are willing to make sacrifices for each other. That's what wins The Tournament. So, just for a week or so, I'm pulling for that amazing team to win it all. They have the talent and they certainly have the heart. Kevin Ware is receiving tons of support and encouragement and quality healthcare treatment. He'll be back next year. Joe Theismann says so. We'll start a new season in a week. Kentucky will scoop up Andrew Wiggins and I'll go ahead and pre-order my 2014 National Champs Tervis Tumbler. But, for this week, I'm changing that bracket pen to Cardinal Red ink and rooting for the team that deserves it the most. Here, in print for the world to read forever, is the only time you'll ever see me say it. What's a Kentucky Fan To Do? So, got any plans this weekend? As a lifelong and loyal Kentucky fan, I’d like to skip the tournament and plunge myself headfirst into Derby festivities, but I live over here in North Carolina, and there aren’t any. Specifically, I live in Wake County, home of NC State and a 45 minute drive to either UNC or Duke. As you can imagine, living here amongst these similarly basketball crazed folks, I find it much more fun when we win the championship than I do when we are knocked out of the NIT by Zack Morris. Fine, whatever. Robert Morris. Actually, living outside of Kentucky for such a long time has allowed me to almost want U of L to win a game or two, and that’s saying something. Go Birds. And while I’m mentioning Kentucky schools in the tournament, here’s hoping that Western Kentucky becomes the first 16 seed to upset a 1 seed. If anyone loves to choke in the tournament, it’s Kansas, so here’s your chance, Toppers! Anyway, as difficult as some of the past week’s games have been for many of us to watch, there has been a multitude of excellent basketball programs available to ease the pain. Let's review my favorites. 1. Of course there has been coverage of Julius Randle joining the Harrison twins, James Young, Dakari Johnson, and Marcus Lee in Kentucky’s next recruiting class. Some analysts are calling this the best recruiting class ever, by anyone, anywhere. (Did you hear that, Fab Five?) And what’s important about that? Well, this kind of news serves as the light at the end of a disappointing tunnel. And of course that light is another banner hanging from the rafters at Rupp. Welcome to the BBN, Julius! 2. Did you catch Bluegrass Kingdom: The Gospel of Kentucky Basketball? Any Kentucky fan would declare it the finest of love letters to our beloved basketball team and the most passionate fanbase ever known. I wager that even someone who didn’t necessarily like Kentucky but appreciates history and good basketball could think of a nice word or two. You will see everyone from Pat Riley to MKG singing the praises of the program. If you missed it, and I hope you didn’t, you can catch it here. 3. We were also drawn into the latest 30 for 30 on ESPN, which heralded Jimmy Valvano and his 1983 NC State Tournament Champions. The documentary is called Survive and Advance, which coincidentally is my mantra for each day with all my sports crazed, busy boys; well-traveled husband; and geriatric dog. But back to Jimmy V... I think that anyone with a heart that isn’t cold and dark has to admire such an inspirational man and the courage with which he lived out the end of his life. The touching way that his former players reunite and reminisce about the days of their unbelievable Cinderella run (which were apparently 30 years ago – excuse me, whaaaat?) brought me to tears. Don’t care who you pull for here in the ACC – you would give Jimmy V. a standing ovation if you could. In "NCAA", "allie", "duke", "western kentucky university"
Today begins my favorite weekend in all of sports - the opening weekend of the NCAA Men's Basketball Tournament. Four days of dancing, Cinderella, upsets, blowouts and the best basketball of the year. If you're participating in a bracket challenge, it's likely that your picks are due by noon today. Still stumped on which 12 seed will upset a 5 seed (it's happened every year since 2002!)? Maybe I can help. I follow college basketball pretty closely throughout the season. Given control of the remote, I'd choose whatever game is on, no matter how big or small the teams or rivalry. When it comes to filling out my bracket, I try to give it a good, educated guess. It's not always easy, but I try researching and somewhat-scientifically choosing a winner. Often, though, it's a total crapshoot. That's what makes it so fun! The game at the bottom of each region bracket is ripe for upsets. A 15 seed has upset a 2 seed 12 times since 2002. I think every Kentucky fan remembers with glee last year's tournament when #15 Lehigh upset #2 Duke. Who can do it this year? Can Albany bring the upset against Duke? How about Florida Gulf Coast vs. Georgetown? A solid upset pick is a # 12 over the #5 seed. I've got New Mexico State over Saint Louis and California over UNLV. Who do you have? I have loyalties and allegiances that often have no rhyme or reason. Here are the things that guide my heart in choosing a bracket. This is totally unscientific. I choose the team from Kentucky. Unless it's Louisville. That means I correctly picked the Morehead State upset of Louisville in 2011. I choose the team from the SEC. I may be a Gator Hater, but I can set that aside in the name of conference loyalty. I choose the team coached by a former Kentucky Wildcat. Let's go Travis Ford and the Oklahoma State Cowboys! I choose the team playing against Duke, North Carolina or Kansas. Those programs don't need any more wins or to gain any ground on our record. I choose the Catholic school team over the public or Protestant school team. I learned this one from my mom. As usual, I've planned my work schedule so that you can find me in my living room all day Thursday, Friday, Saturday and Sunday watching hoops. I can't wait for the madness to begin! I might slave over my bracket starting on Selection Sunday, but once that ball is tipped I just want a great tournament, regardless of my picks.